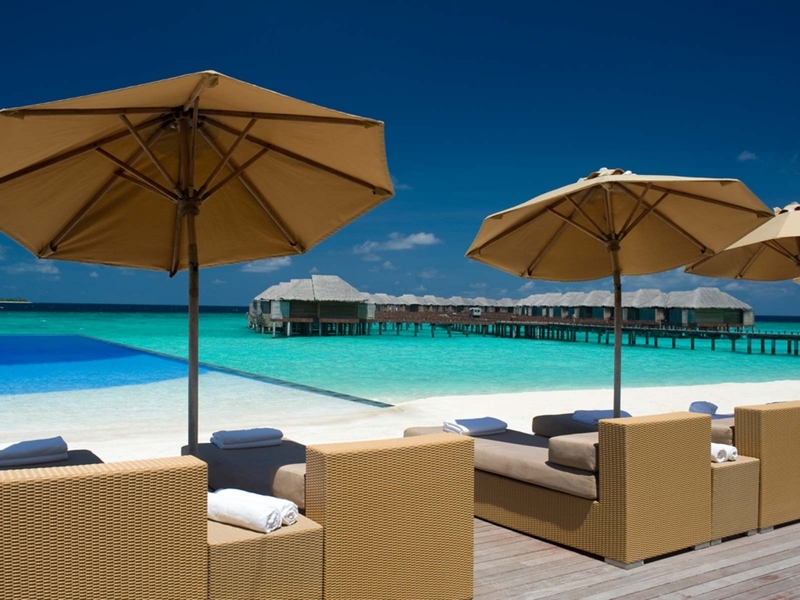 Beach House at Iruveli is a modern resort in the Haa Alifu Atoll that can be reached by domestic flights (transfer time from Malé: 90 minutes). Not only will you discover the endless white beaches characterizing the Maldives, but also a bit of Maldives culture – this resort is the first one to feature an art gallery with works of local artists. 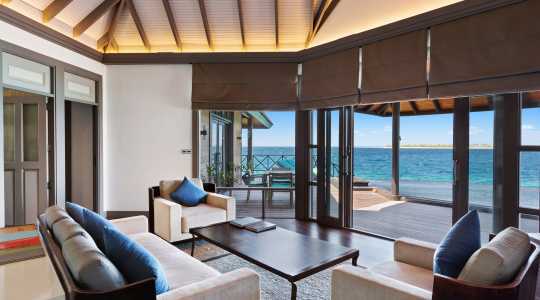 If you like the sound of lazy afternoons in a lovely swing overlooking the turquoise water, followed by a romantic seafood dinner in the sunset, then Beach House at Iruveli won’t disappoint you. 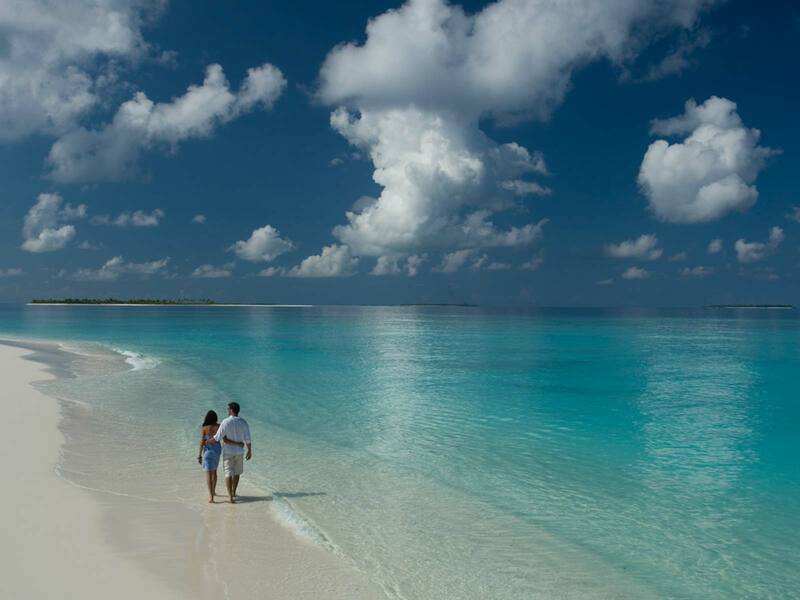 A holiday here is pure bliss for all your senses. 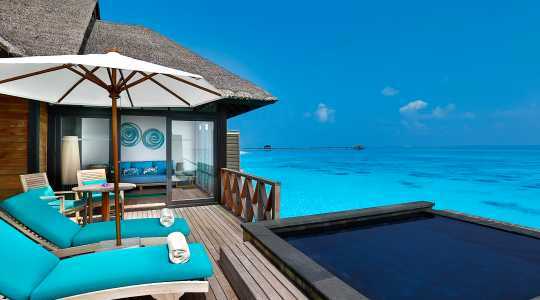 Forget about the rest of the world and simply enjoy this secluded Maldives paradise. 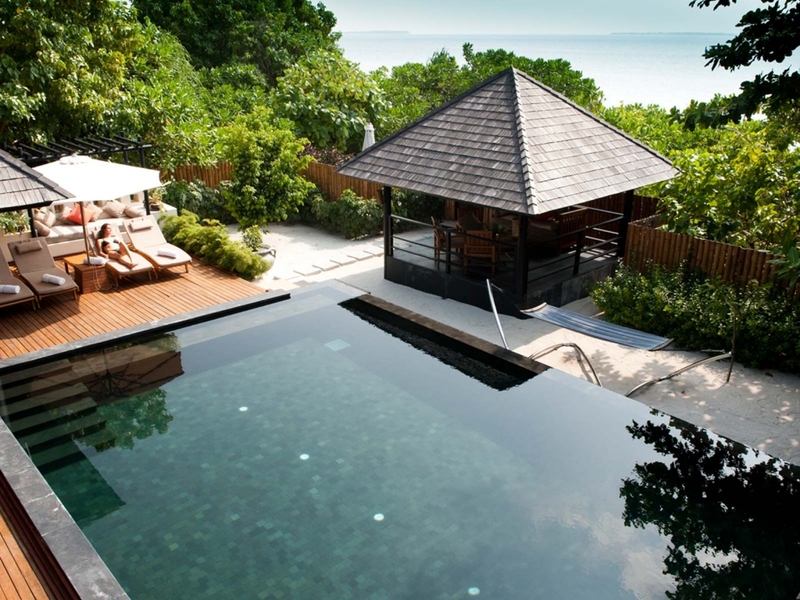 The Beach Bungalow (150 sqm) is the ideal choice for families since it is both expansive and features its own private plunge pool. This beautiful bungalow is located by the beach on the west side of the island, which means that you get excellent sunrise views. The inside of the bungalow is spacious with interior dominated by dark wood and grey stone. 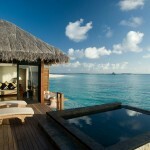 You have an open-air bathroom, as well as a private cabana on the stunning beach. 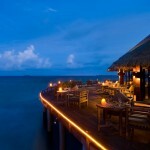 The Sunrise Water Villa (110 sqm) is built on stilts above the water. 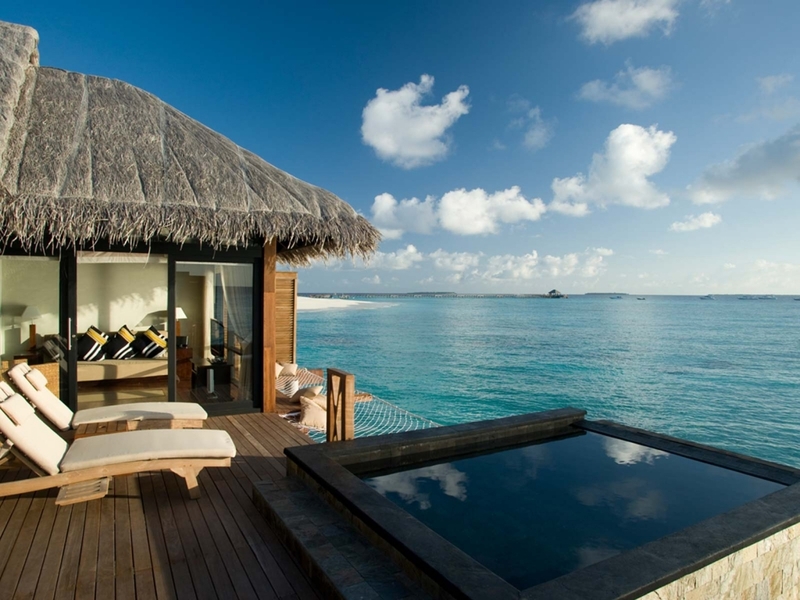 Your private sundeck with plunge pool makes for endless days of relaxation. 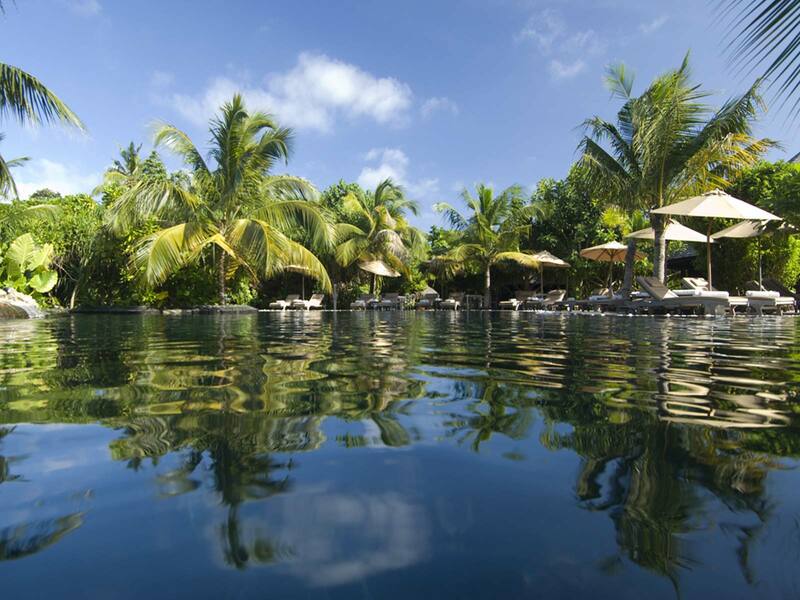 The sundeck has direct lagoon access, which means that snorkelling is never far away. The interior is stunning and airy. Added luxury comes in the form of a semi-open air bathroom with a tropical rain shower. 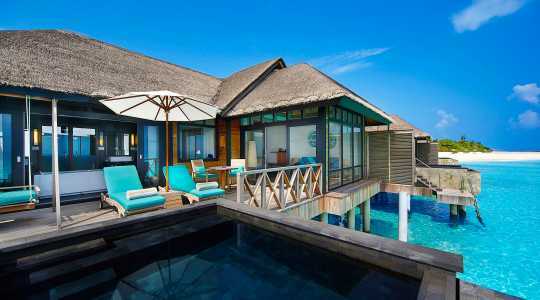 The Sunrise Water Villa can accommodate three adults (or two adults and two children). 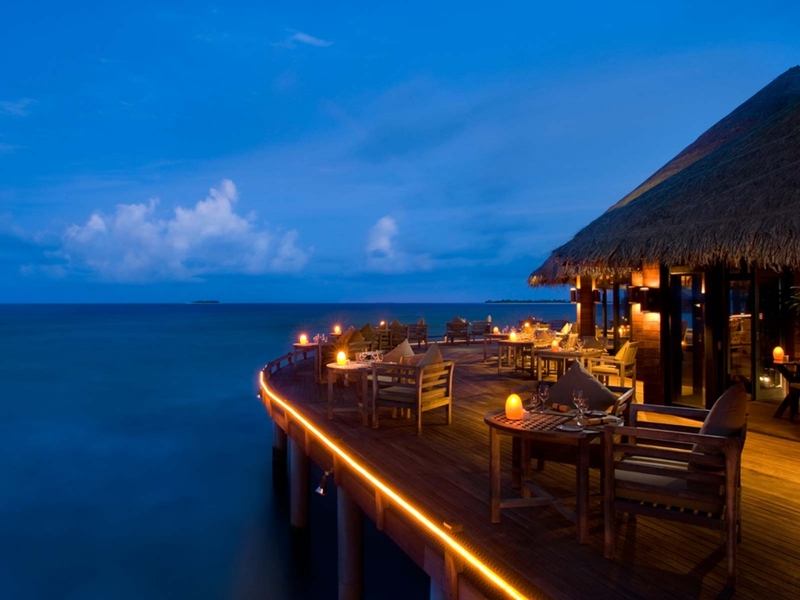 The Sunset Water Villa (110 sqm) is built on stilts above the water. Your private sundeck with plunge pool makes for endless days of relaxation. 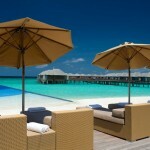 The sundeck has direct lagoon access, which means that snorkelling is never far away. The interior is stunning and airy. Added luxury comes in the form of a semi-open air bathroom with a tropical rain shower. 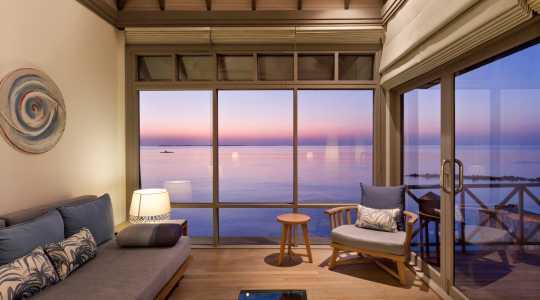 The Sunset Water Villa can accommodate three adults (or two adults and two children). 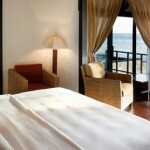 The Beach Suite (225 sqm) is a masterpiece of earthy tones and luxurious furnishings. 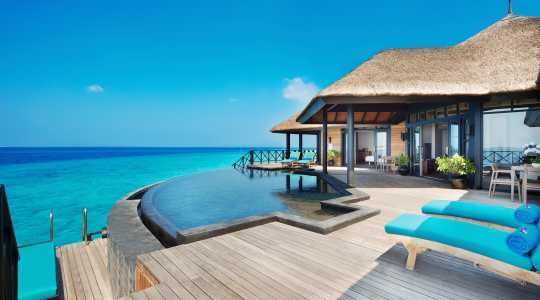 Featuring private beach cabanas, a plunge pool and an outdoor bathroom with a rain shower and an i-Spa bathtub, the Beach Suite makes for an indulgent Maldives holiday. 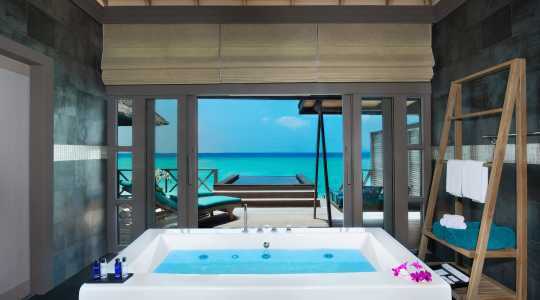 The Grand Water Two Bedroom Suite with Private Pool (350 sqm) offers pure holiday bliss. 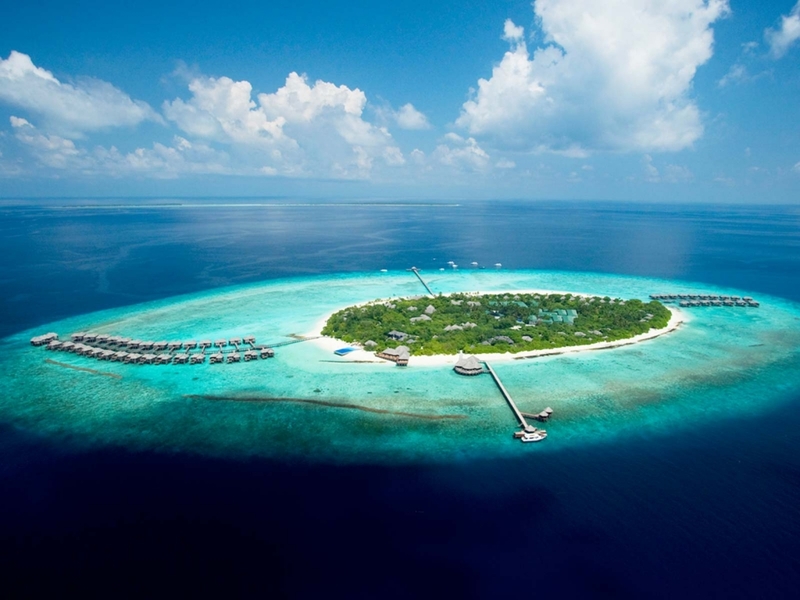 With its location directly above the Indian Ocean, you will feel as one with the infinite sea below you. Your expansive private sundeck features a stunning infinity pool as well as steps down into the inviting waters. This suite also includes two beautiful bedrooms and three bathrooms, making it ideal for groups travelling together. 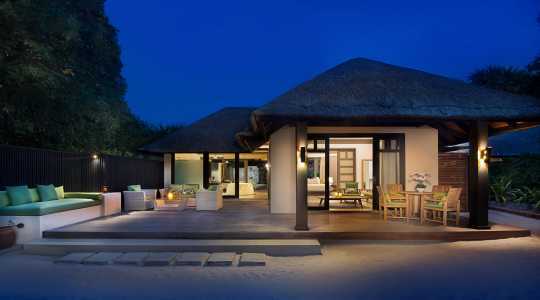 The thatched roof adds a traditional Maldives touch to this accommodation, which sleeps up to six guests. 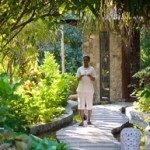 This is a full-service resort complete with modern facilities and activities for all ages. The fun Turtle Club caters for guests aged 3-12 years. Do you think your child would fancy dressing up as a pirate and jumping on a jumbo trampoline? Then the Turtle Club makes for the ideal pastime. They also offer a babysitting service. Scuba diving is the grownup version of the Turtle Club. Multilingual diving instructors will show you the best reefs of the atoll, so you’d better prepare for amazing underwater scenery. Snorkelling, waterskiing, catamaran sailing and kayaking are some other water activities available. For guests preferring to stay active on dry land, there is a fully-equipped fitness centre including three swimming pools, tennis, gym and volleyball. 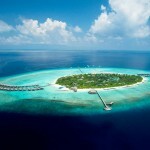 The resort also arranges popular tours of the island where guests get to discover the true Maldives. De’Spa provides a much needed escape from reality and everyday stresses. 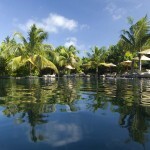 Its secluded location surrounded by banyan trees and complete serenity makes you forget about the rest of the world. As it should be. 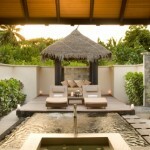 Enjoy traditional Maldivian treatments and aromatherapy to rejuvenate your body and soul. The famous Jet Lag Massage is complimentary. 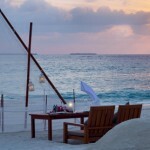 Boasting excellent restaurants, JA Manafaru caters for all tastes. Fancy grilled seafood in a casual beach setting, or perhaps dining below sea level in an impressive wine cellar? The choice is yours. The resort also arranges private dining experiences if you want to enjoy an amazing meal in the seclusion of your own villa or on a deserted island. Kakuni is located directly above the glorious Indian Ocean on the northern side of the island – and thus serves outstanding views with your breakfast or dinner. How about a Champagne breakfast to start off the day, and enjoy local delicacies in the sunset? Ocean Grill is a beachside restaurant serving freshly caught seafood and excellent wines. Indulge in fine cuisine together with your loved one. The Cellar is a spectacular restaurant and wine cellar situated eight feet below sea level. They also arrange private wine tastings. Infinity Bar is a tranquil venue located by the pool, perfect for a light midday meal. 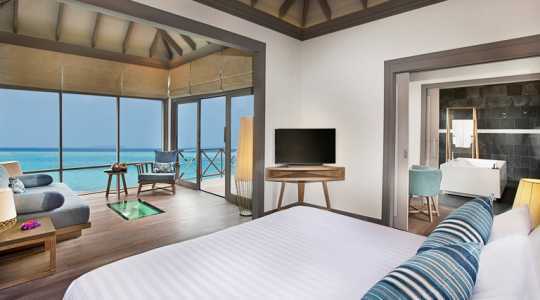 Simply Maldives Holidays offer a Bed and Breakfast option, Half Board Package and a Full Board Package to guests staying at Beach House at Iruveli. A special scented bath setup, one bottle of champagne per stay, a romantic turndown service serving cocktails, canapes and chocolates and an in-villa romantic breakfast experience. terms and conditions may apply – A copy of the wedding certificate valid within 6 months of marriage may be required at check-in.